The Enforex Quito is housed in a gloriously beautiful colonial building which boasts an interior patio area. 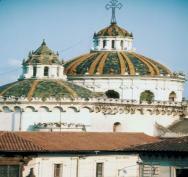 The language school is located in the residential region of La Carolina in Quito. Below you can find out more about these options, observe course details and read the student reviews. Use the green button at the bottom of the page to book a course at Enforex Quito. School info: Comfortable learning facilities, solarium, auditorium, disabled access and elevator, free internet connection. Situation: School is in a quiet and safe neighborhood in Quito, centrally located near bus routes, restaurants, shops, bars, museums and nightlife hotspots. Carolina Park nearby. Students can make use of the superb indoor multipurpose court at the Enforex Quito to play numerous different sports including basketball, speed soccer, racquetball and volleyball; or if they prefer a break and a change of scenery they can pay a visit to the nearby Carolina Park. The language school is situated in a quiet and safe area of Quito called La Carolina as it is a residential area there is perfect tranquillity for the school's students to study in. There is a bus route that passes by the Enforex Quito which serves the whole city so transportation into the main city centre is very simple. There are 21 spacious and airy classrooms at the school and a well stocked library. The language school has its own cafeteria and auditorium. There is even a solarium available if students wish to top up their tan! The Enforex Quito has internet access and also wireless connection for laptops to be used. The school has full disabled access with the use of an elevator to reach the upper floors. The intensive Spanish courses range over 9 levels from beginner to superior, the maximum students per class is always 4 but the average is generally only 2 per class.